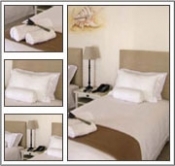 An overnight stay at the Hub Culture Durban Pavilion, with full room and service. Breakfast included. A choice of four bedrooms are available for 1-10 December, 2011 and are bookable on a daily basis.Â Includes complimentary ADSL internet, pool access and the opportunity to book a host of activities. All four rooms have their own elegant character and are tastefully styled in warm earthy tones alternated with calming white. Although styled differently, they are all spacious, fully air conditioned and equipped with all the pleasant comforts and conveniences you need â€“ and more. King size extra length beds in which you may well sleep better than at home, an en suite modern bathroom with high quality shower (two have a bath as well), tea and coffee facilities, TV with satellite, wireless hotspots, telephone, a dressing table with hair dryer and plenty of space for all your belongings, some of which you can keep in your private safe.